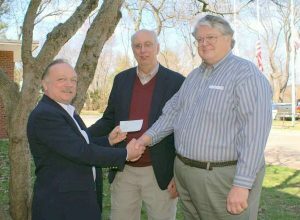 FEMARA president Mike Raisbeck, K1TWF presenting $5,000 donation to ARRL Foundation president K1KI (right). Fellow board member K0QB is shown (center). The Federation of Eastern Massachusetts Amateur Radio Associations has been named to the Maxim Society based on its past scholarship donations to the ARRL Foundation. A recent ARRL Board ruling now allows ARRL Foundation donations to be included in achieving Maxim Society status ($10,000 or more). “FEMARA is now Maxim thanks to all the donations to the FEMARA Scholarship Fund over the years,” announced Lauren Clarke, KB1YDD, ARRL Development Manager to FEMARA president Mike Raisbeck, K1TWF.